ABSTRACTS OF OMAHA AND PONKA MYTHS. This character resembles Ictinike in some respects, though he is opposed to him in this myth. 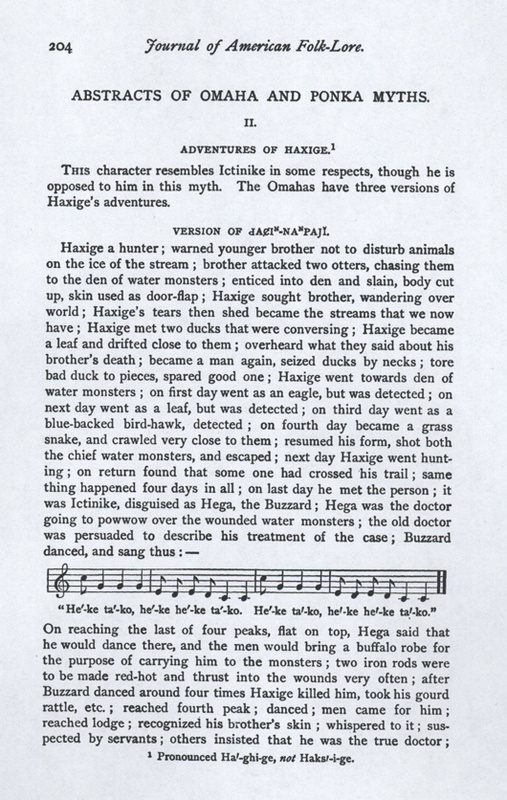 The Omahas have three versions of Haxige's adventures. "He'-ke ta'-ko, he'-ke he'-ke ta'-ko. He'-ke ta'-ko, her-ke he'-ke ta-ko." Haxige killed monsters, cut up the flesh in small pieces and put in kettles of hot water; as he stayed long in lodge people complained, and sent grass snake to see what was the matter; grass snake peeped in at hole, recognized Haxige, but was caught; snake's mouth stuffed with long strip of meat from kettle; crawled back to people; could not speak aloud till they removed meat from his throat; they chased Haxige; he fled with skin of brother; reached a boiling spring, plunged into it, became a rock imbedded in the ground at bottom; they tried to drag him out, but failed; they went back, and Haxige came from spring with brother's skin; went home; said he would make a sweat-lodge; went for four stones to a lofty headland. Addressed first stone: "Ho, venerable being! I have come for you to powwow." Said to next, "Ho, venerable being! I have come for you to powwow over me." To third, "Ho, venerable being! I have come for you because you can cause a person to bathe." To the last, "Ho, venerable being! I have come for you because by your aid a person can bathe all over. I have come for you that you may cleanse me from all impurities. May I come out in sight on many different days! Venerable being, may I and my young ones come in sight on the four peaks! I pray to you, thou superior god above and thou superior god below! On different days may I and my young ones come in sight!" Poles then obtained; went for water, addressing it in prayer; made fire, put stones on, then dropped a medicine on, making sparks; poured the water over his brother's skin inside the lodge, restoring him to life; but when Haxige let him go the brother became a ghost again; done four times; Haxige despaired of keeping brother alive; spoke of separating. "As you go in this manner, red men shall go and never return." Haxige departed; met aged Beaver-woman, who was making a boat; she told him of a flood coming because Haxige had killed the water monsters; Haxige told her that he was ready for it. "But if they fail to kill Haxige by the flood they will send serpents over the earth." Haxige did not fear them, threatening to kill them; he told how he could escape from a deep pit and a severe snow-storm; then he killed her; returned home; made another sweat-lodge; brother would not stay alive, so Haxige told him that they must change their forms. "You shall become a young male big wolf, with long blue hair on the space between the shoulders, and I will become a very large male deer, with horns full of snags, and with hair which has been made very yellow by heat, scattered over my forehead." VERSION OF FRANCIS LA FL�CHE. 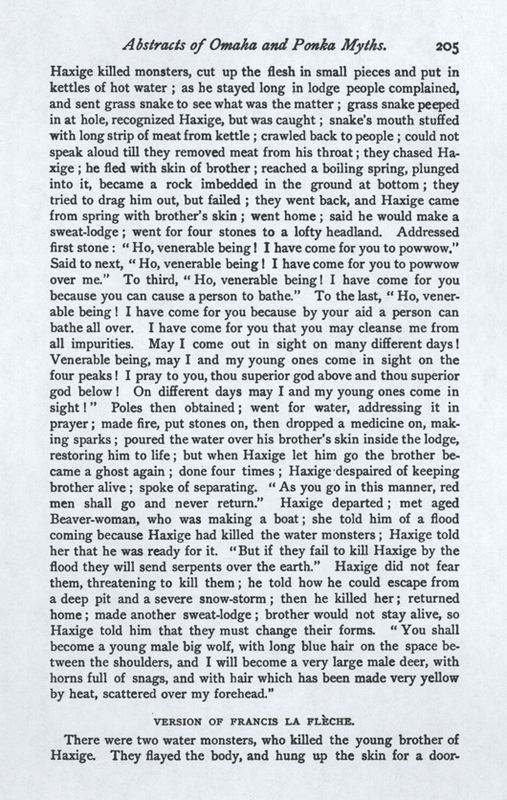 There were two water monsters, who killed the young brother of Haxige. They flayed the body, and hung up the skin for a doorflap. They invited all the animals to a feast, when they boiled the body, dividing it among the animals, thus bribing them to silence. Haxige missed his brother, and went in search of him. He reached a stream where two wood ducks were swimming. The conversation of the ducks and the transformation of Haxige into a leaf are given in both versions. One of the ducks repeated his words to Haxige: "O elder brother, when Haxige's young brother was killed I received only a little finger as my share, so I said that I would tell Haxige about it whenever I saw him." He then told Haxige about the Buzzard's going daily to treat the wounded monsters. The good duck was rewarded by Haxige, who stroked him along the head, forming a crest, and making the feathers whitish which were next the outer corners of the eyes. As Haxige went, the tears from his eyes formed rivers. He met the Buzzard, and induced him to sing his magic song, thus: — "He'-ki-maⁿ'-daⁿ, he'-ki he'-ki maⁿ'-daⁿ, he'ki he'-ki maⁿ'-daⁿ." 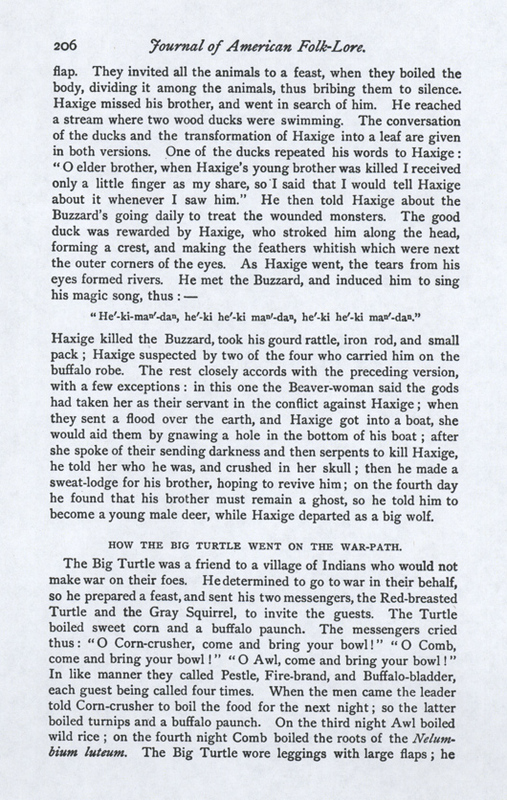 Haxige killed the Buzzard, took his gourd rattle, iron rod, and small pack; Haxige suspected by two of the four who carried him on the buffalo robe. 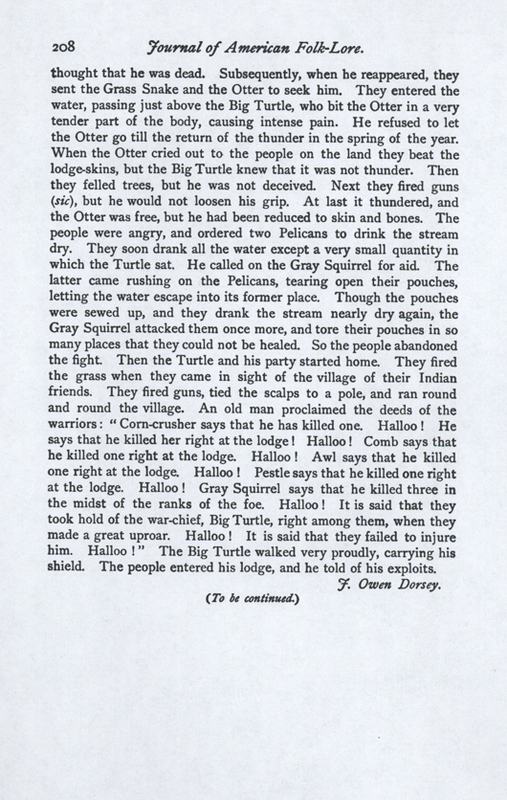 The rest closely accords with the preceding version, with a few exceptions: in this one the Beaver-woman said the gods had taken her as their servant in the conflict against Haxige; when they sent a flood over the earth, and Haxige got into a boat, she would aid them by gnawing a hole in the bottom of his boat; after she spoke of their sending darkness and then serpents to kill Haxige, he told her who he was, and crushed in her skull; then he made a sweat-lodge for his brother, hoping to revive him; on the fourth day he found that his brother must remain a ghost, so he told him to become a young male deer, while Haxige departed as a big wolf. HOW THE BIG TURTLE WENT ON THE WAR-PATH. "Ke'-taⁿ qaⁿ'-ye wa'-te kʼu'-he ca'-na�-ga', hi'-e tce'-e go', hi'-e tce'-e go'." thought that he was dead. Subsequently, when he reappeared, they sent the Grass Snake and the Otter to seek him. They entered the water, passing just above the Big Turtle, who bit the Otter in a very tender part of the body, causing intense pain. He refused to let the Otter go till the return of the thunder in the spring of the year. When the Otter cried out to the people on the land they beat the lodge-skins, but the Big Turtle knew that it was not thunder. Then they felled trees, but he was not deceived. Next they fired guns (sic), but he would not loosen his grip. At last it thundered, and the Otter was free, but he had been reduced to skin and bones. The people were angry, and ordered two Pelicans to drink the stream dry. They soon drank all the water except a very small quantity in which the Turtle sat. He called on the Gray Squirrel for aid. The latter came rushing on the Pelicans, tearing open their pouches, letting the water escape into its former place. Though the pouches were sewed up, and they drank the stream nearly dry again, the Gray Squirrel attacked them once more, and tore their pouches in so many places that they could not be healed. So the people abandoned the fight. Then the Turtle and his party started home. They fired the grass when they came in sight of the village of their Indian friends. They fired guns, tied the scalps to a pole, and ran round and round the village. 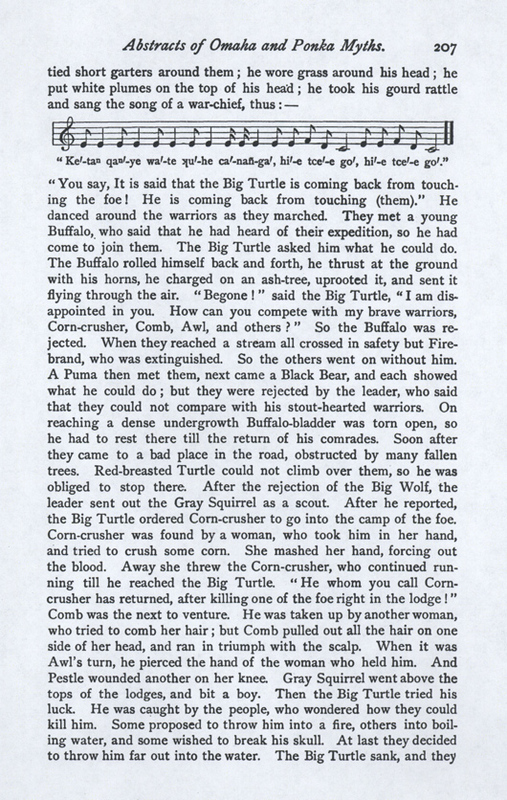 An old man proclaimed the deeds of the warriors: "Corn-crusher says that he has killed one. Halloo! He says that he killed her right at the lodge! Halloo! Comb says that he killed one right at the lodge. Halloo! Awl says that he killed one right at the lodge. Halloo! Pestle says that he killed one right at the lodge. Halloo! Gray Squirrel says that he killed three in the midst of the ranks of the foe. Halloo! It is said that they took hold of the war-chief, Big Turtle, right among them, when they made a great uproar. Halloo! It is said that they failed to injure him. Halloo!" The Big Turtle walked very proudly, carrying his shield. The people entered his lodge, and he told of his exploits.